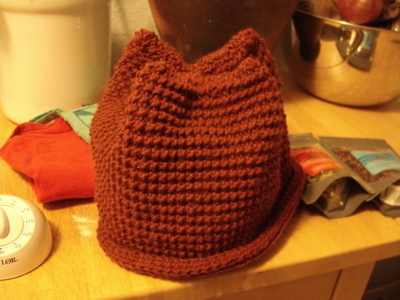 Last night, after a delicious bellyful of sushi (two words: garlic sashimi), I returned home to finish the tea cozy, and I am really pleased with how it turned out. 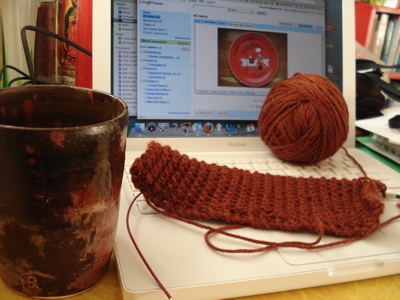 I listened to the most recent episode of the Knitpicks podcast while I worked, and Kelly Petkun was talking about a French press cozy. I could most certainly use one of those, as each morning I pour the first cup of coffee from my press into an insulated mug so that it will stay warm until I am ready for it. Boh was up before 6 today, which means I didn’t have much choice. 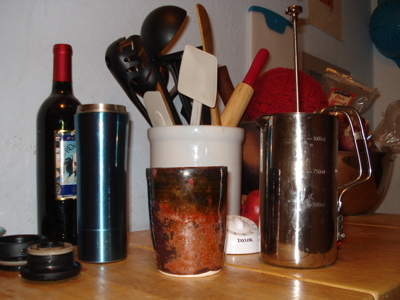 I begin each morning with a press pot of coffee. 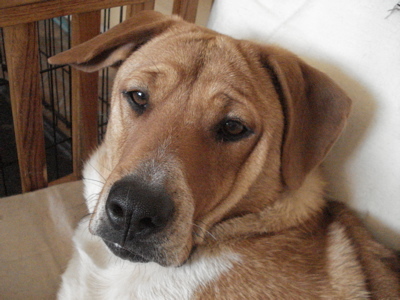 The dog is no longer scared of the sound of my coffee grinder, which is a step in the right direction. I don’t exactly require coffee to function, but I do strongly believe that my daily happiness level is directly related to how much coffee I have consumed. I do, occasionally, go without, just to remind myself that I can, but today is not one of those days. This morning I snapped a photo (before promptly dropping my camera — I think it is okay) while (sort of) patiently waiting for my coffee to be ready. Push the plunger down too soon, and it sputters, sending grounds and coffee all over the counter and chastising me for not being able to wait my turn. 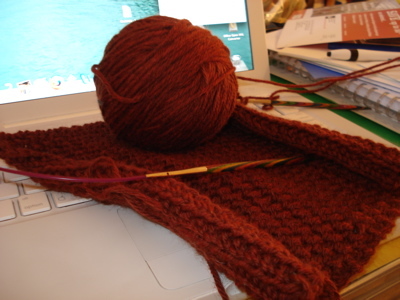 Here’s where I am with the tea cozy: it is 17 inches long — 6 more to go and then seaming and finishing. Knitting this has been calming — perhaps because it is my answer to that feeling of helplessness that seems to accompany tragedy — but also because I really like the stitch pattern. The p1, ktbl rhythm is very nice, and the definition of the twisted stitches is particularly stunning. I have some scarves planned as thank you gifts for three men who helped me with something earlier this fall, and I think this stitch pattern will be perfect. I must get back to it, but before I pick up my needles again, I want to say thanks — for wandering over to my corner of the web, and for returning. I’m having a lot of fun here. 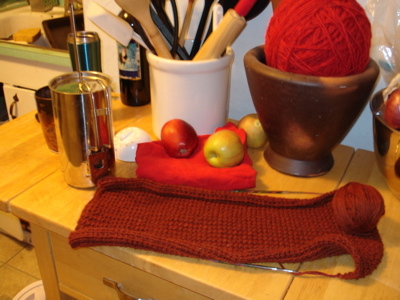 I spent all unallocated evening time working on the tea cozy, and became so engrossed in my work that I forgot about the beets I was roasting in the oven. Normally I roast them for a bit over an hour, depending on their size, and it was a good 2 hours before I remembered them. They are still wrapped in foil in the fridge, intended for salads or to be eaten alone. We’ll see if they are still delicious. 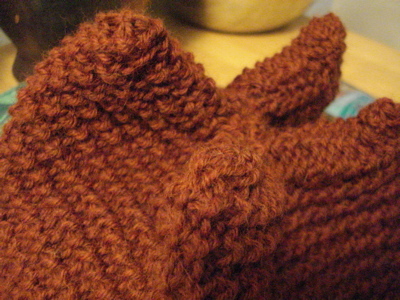 Here’s an updated shot of the tea cozy — it isn’t quite this red in “real” life. I’m going to try to get a few more inches done before work. Wish me luck! 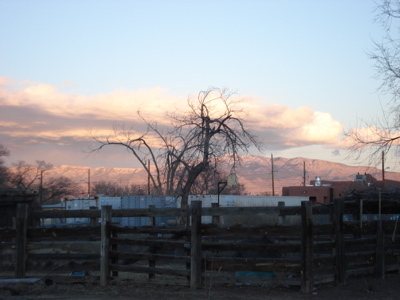 A family that is very dear to me has experienced what can only be described as tragedy: the loss of a wonderful person — son, brother, friend — to an act of senseless, seemingly random violence. There is a celebration of his life this weekend, and the final spreading of ashes, and I am planning to head down and spend the night with them. 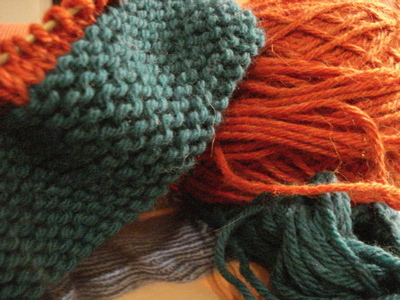 Last night, at knitting group, I asked, “What do you knit for someone who is dealing with that kind of loss?” In addition to the obvious: listening, hugging, being present, I have been feeling the need to “make”. A tea cozy was suggested, and upon thinking more carefully about the intended recipient, this is just right. I cast on last night, and am setting other projects aside in hopes of completing this before this weekend’s celebration. After looking through my pattern books, I settled on the Cashmere Tea Cozy from Last Minute Knitted Gifts (Ravelry link). 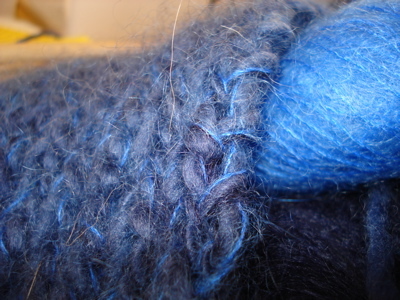 I love the way this is gathered at the top, and I really like the simple stitch pattern. 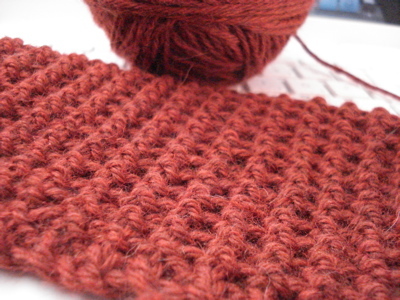 I am making this in a reddish-orange-brown (sort of like the color of adobe) in Cascade 220 Heathers, and the stitch definition is beautiful. It would be perfect for a man’s scarf. I have just under 4 inches completed, after starting with size 8 needles and deciding to go down to 7s for a tighter fabric (a decision which enhanced the stitch definition) last night, and knitting to an old episode of Cast On this morning before work. I think I will be able to get this done by Saturday morning. Suggestions for special tea to accompany this? The answer is “No” to all of the questions you are asking. (“Are you a speed skater?” “What about a super hero?” “Did you actually buy those?” They were a gift.) I went for a run on Friday with the dog, and wore these under my shorts for added protection from the gusty winds in the bosque. Saturday morning, pre-sunrise, the dog was begging to go outside, and I was awake, so I pulled these on to keep me warm. 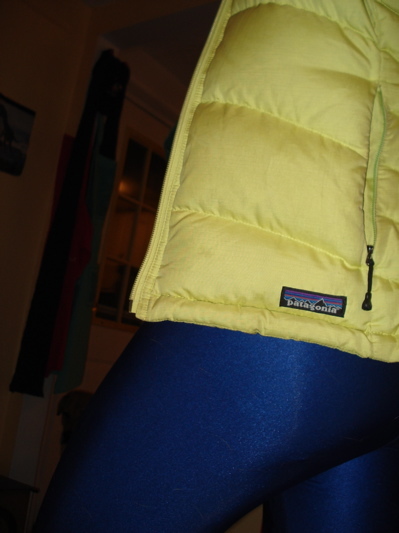 Upon returning inside, I realized how ridiculous I looked, and snapped this photo. Feel free to laugh out loud. I share this with you in part because I settled in with a cup of coffee, episodes of CraftLit and Cast On and some knitting deserving of some attention: my Fleece Artist Tiger Socks. 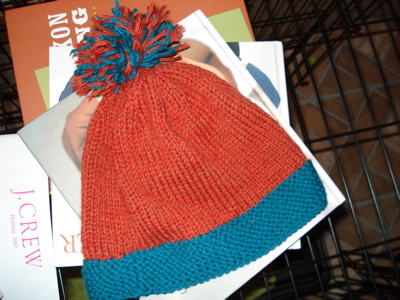 I finished another garter brim hat — a bit too big for my small head on purpose. Not sure who this will go to, but I love this. My Thanksgiving host called this my “watermelon” hat, and I like the name. 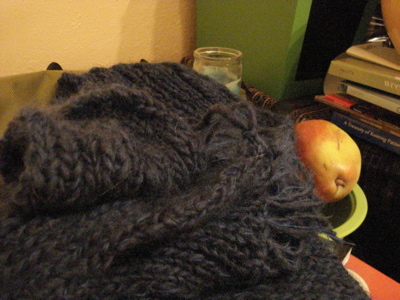 You may notice the style of this photo — consider it a tribute to cosy of cosymakes. The pattern is hers, and can be found on her blog for free here. 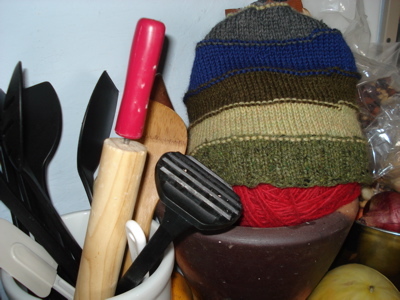 I love the photos she takes of her hats, and thought that I would display the result of her scrap-happy celebration hat pattern in a similar way. Thanks, cosy! This hat is made of Cascade 220 and Jo Sharp Silk Road Aran Tweed scraps, and is destined to go to my brother — the brim yarn is leftover from the pair of Dashing I made for him. 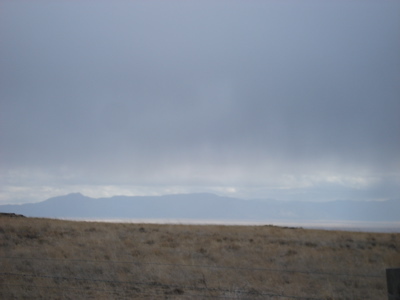 Boh and I went for a hike in the rain this weekend — we were the only ones out wandering, and it was absolutely beautiful in that foggy, forlorn, expansive kind of way. 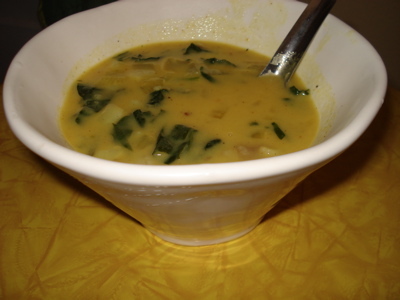 The weather was the kind that makes you want to eat soup, and, inspired by this post by Amy at angry chicken, I modified a Moosewood recipe for curried spinach and pea soup to be a warm, soothing mixture featuring kale, potatoes and Thai chile paste. That’s all for now. I did even more knitting than I ‘ve posted here this weekend, and perhaps in the morning light, I’ll be able to take a few more pictures to share. P.S. I’m sure you all already know about how fantastic the CraftLit and Cast On podcasts are (links above), and that I’m just a little late to the party, but on the off chance that you haven’t given these a listen, go download an episode. You won’t be disappointed. No, not the fun kind. I’m talking about a modem swap. More time on the phone with my ISP this weekend. The good news: swapping modems is free, whereas the initial solution would run me about 300 bucks. The bad news: the modem won’t arrive until the end of the week. You know the drill: all nonessential email will remain unanswered until I can surf the web in my PJs from the privacy of my home. More good news: an FO to share. 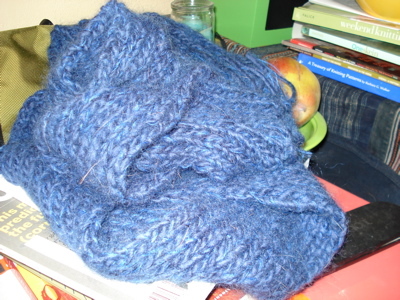 I finished the blue purl scarf. I wrapped it around myself in celebration, and I must say, the idea of keeping it did scamper through my innermost thoughts. 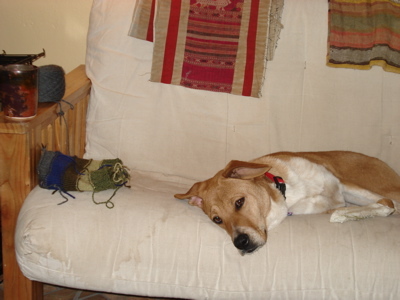 Luckily, it kept on scampering, as this scarf is intended for my very best friend. 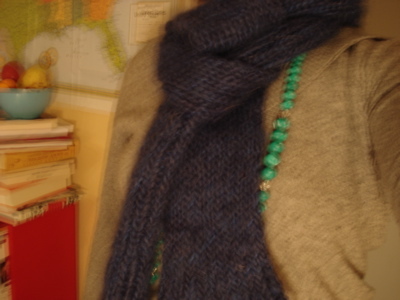 I’ll see her in a few weeks, and the weather on the East Coast should make this scarf wearable immediately. I’ll be bringing mine as well, just in case the temptation to wrap myself in one of these wonderfully long scarves becomes unshakable on my flights East. 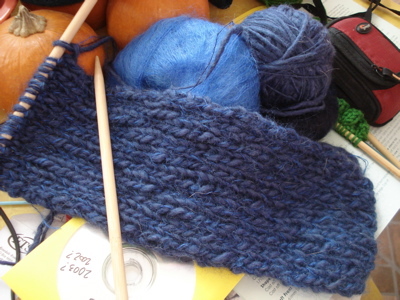 Also…I found myself without a mindless knitting project today, so I cast on for another garter brim hat from LMKG. I wear the pom-pommed version I made for myself all the time. Not sure if this will be a gift or if it will jump into my knitted accessory rotation. Also, Cosy over at Cosy Makes nominated me for a You Make Me Smile award here — yay! Thanks, Cosy! I cannot hide my blog-norance (blog+ignorance?) — I don’t know how to add a button to a blog entry. Help, please. 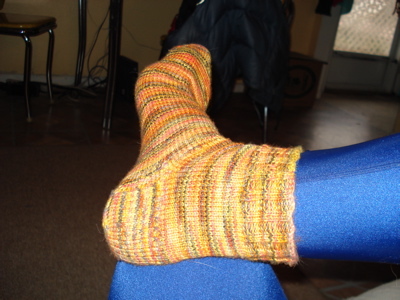 I have been wearing my new legwarmers non-stop. They are so cozy and warm, and thin enough that they can either be concealed under jeans or used to display my love of the 80s. Now that they are finished, I am out of knitting sans counting — I need something for after a long day of work or for before my coffee has taken effect in the morning. 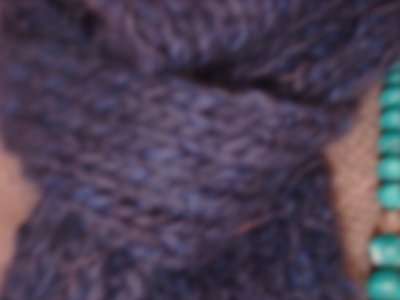 Enter Purl Scarf #2, intended for a friend I will see later this month, stage right. I started this last night while watching an episode of Heroes (via Netflix), and I already have about a foot completed. The jury is still out on Heroes — I am a bit lost now that I’ve finished all twenty billion episodes of Twin Peaks Season 2 (and caught up on Stash and Burn). 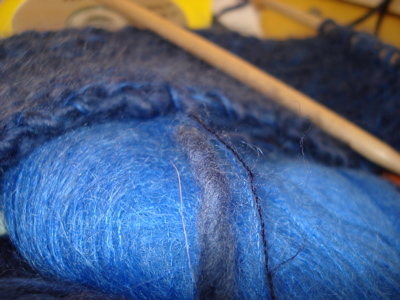 Details: Manos del Uruguay in a dark blue (color A? 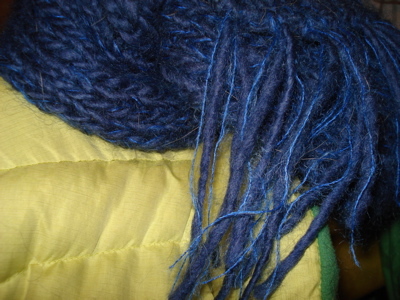 ), Madil Kid Seta in an electric blue (no tags) and Knit One Crochet Too Douceur et Soie in Color 8645. I think. I’m using size 13s instead of 15s and I cast on 20 st instead of 16, just like the one I made for myself.